It seems a pretty simple thing, doesn’t it? Using a wide angle lens for landscape photography is something most people try as soon as they become interested in photographing landscapes. I remember my own first attempts well. I had just purchased a Tamron 19-35mm lens for my Canon 35mm film camera. Yes, those were the days before digital and wide angle lenses weren’t very affordable. I wanted the lens for a winter holiday to Iceland having read that anyone seriously photographing landscapes used a wide angle lens. I remember vividly climbing the rim or a frozen, snow-covered volcano with my camera and this lens. And wow! The field of vision was amazing. I could see so many mountains around me. This lens was amazing, and it made a huge difference to my photography. Except that it didn’t. When I got the film back from the lab, the landscape appeared almost flat and featureless because I didn’t know how to use my wide angle lens properly. Let’s look at a few important points to keep in mind when you’re using a wide angle lens for landscape photography. When using a wide angle lens, tilting the camera introduces distortion. Sometimes this can enhance your image whilst at other times you might not want it. The effect is most obvious when photographing buildings or architecture. 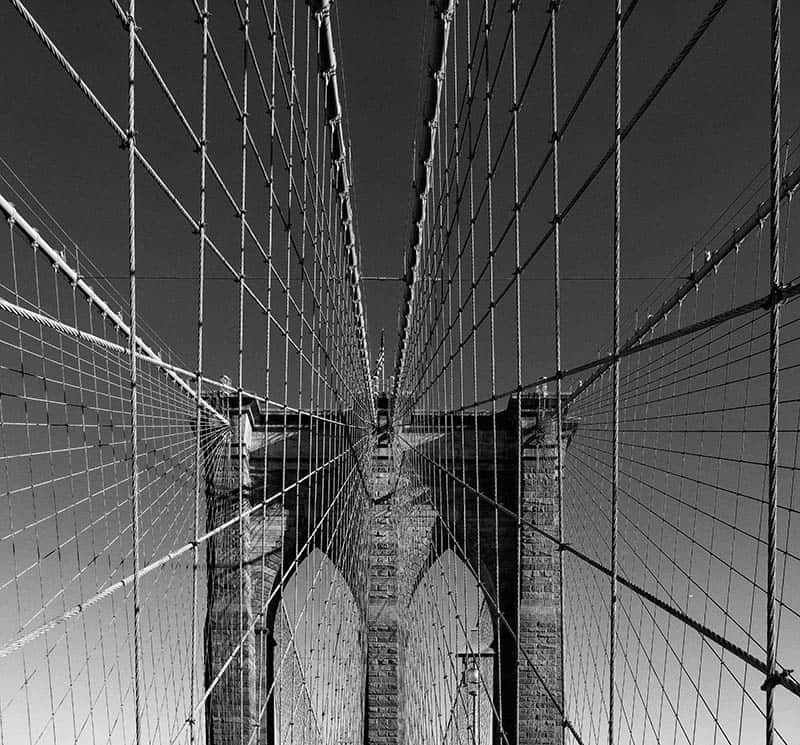 Take the following example of the Brooklyn Bridge in New York which was captured using a wide angle lens. 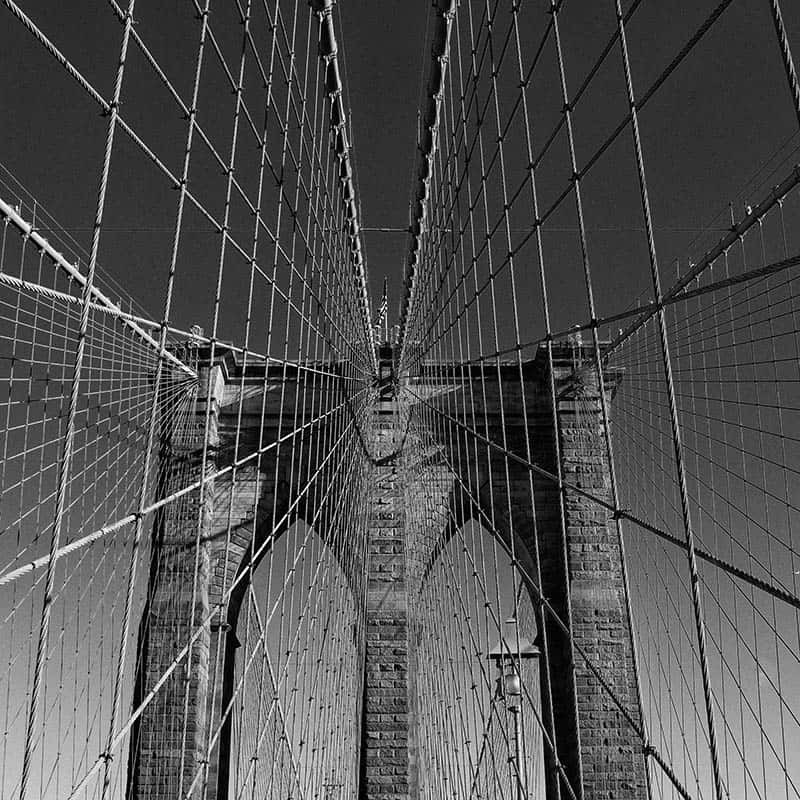 In this first photograph, you can see the vertical sides of the bridge and the wires converge inwards. Tilting the camera backwards in order to position the bridge in the frame properly has exaggerated the effect. If it had been possible to position the bridge correctly whilst keeping the back of the camera perfectly vertical the image would have looked like the one below. Notice how the verticals of the bridge and the cables are now upright rather than converging. Whilst this distortion is neither good nor bad, you should remain conscious of the effect. It’s only then that you can deliberately use it in your photography. One particular use of this if your shooting landscapes using a wide angle lens is to deliberately tilt the camera and lens backwards to exaggerate scale. You can see this in the following shot where the pier seems to loom large overhead. 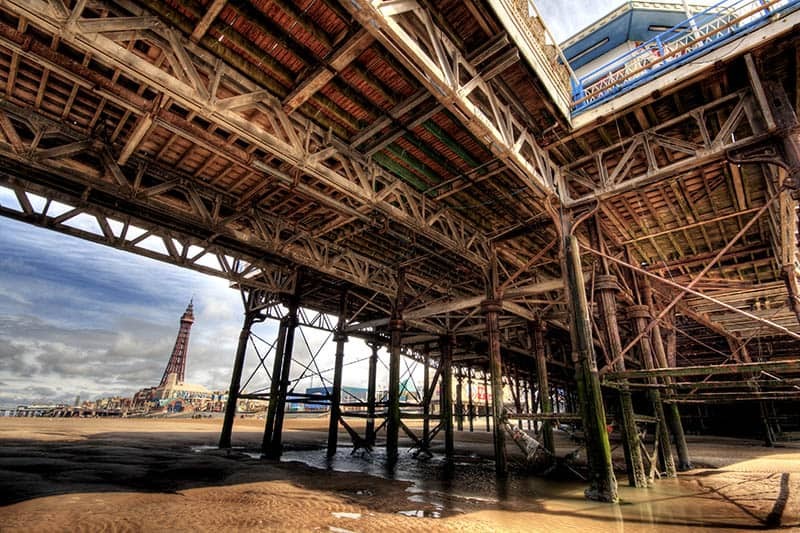 Here the angles of the pier create a more dynamic composition. The alternative to this is to tilt the camera and lens forward. This makes near foreground objects dominate the scene. When using a wide angle lens for landscape photography it’s usually important to create a strong foreground. Without a strong foreground, the viewer's eye and attention will wander around the scene without settling. Take the following image which was captured using an Olympus EM5 micro 43 camera and Olympus 12-40mm lens at the wide angle end. Here I’ve angled the camera downward making it possible to move much closer the rock and use it to fill the frame. This rock was only around 12-15 inches across, yet it fills the lower part of the frame. Making the rock so dominant helps to hold the viewers’ attention in the frame. 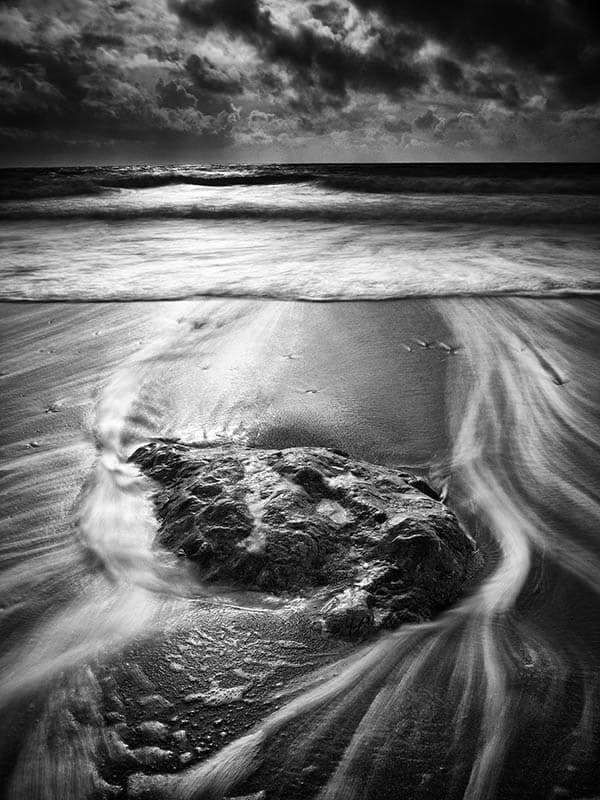 Whilst your eye may follow the receding water down to the sea, it’s then pulled back by the dominance of the rock. Of course, to make this technique work well you do need to get in close to the subject. This usually means that you also need to get low and closer to the ground. Getting low when using a wide angle lens should be another priority in many photos. The wide angle lens will distort distance making an object that’s only a couple of feet from the camera appear much further away. If you have your camera mounted on a tripod at standing eye height, objects will appear much further away than you imagine them. In the previous shot, I had to collapse my tripod to its lowest level to achieve the shot. The same is true with the following image. In this image, I closed all the sections of the tripod in order to get low enough. Notice though that there is little distortion as I didn’t have the camera tilted. This causes the perspective from the lens to appear quite natural despite the lens being the equivalent of a 24mm on a full frame camera. You can see another example using a much wider lens below. Here I was handholding the camera only a few inches from the floor whilst shooting using a wide angle lens. The Fuji 10-24mm lens I shot this with was set to 11mm on a Fuji X-T2, which equates to around 17mm on a full frame camera. Again, the back of the camera was vertical to prevent distortion. It was also necessary to get very low and close to the small pool of water in the foreground otherwise it would have become completely lost in the scene. It’s nowhere near as large as it looks in this photo. A final point to keep in mind when shooting using a wide angle lens is not to be lazy. A lot of photographers I talk to like to close the aperture of the lens down as small as it will go to achieve maximum depth of field. This is also the advice you often see published in magazines or at least did a few years back. This is what I call lazy shooting as it avoids selecting a good aperture and focus point. When you select a good point of focus using a wide angle lens, you can achieve a much greater depth of field than you might imagine. An alternative and better approach to selecting the smallest aperture is to select a focus point and aperture to take a test shot. Then you can zoom in on the back of your camera to check the depth of field. If you haven’t achieved enough depth of field to keep the foreground and distant objects sharp, change the point of focus. If the foreground appears soft move the point of focus nearer to the camera otherwise move it away from the camera. Only when you know you can’t achieve the required depth of field by changing the focus point should you change the aperture. Try to avoid using the smallest aperture your lens supports or even within a couple of stops of this. Very small apertures tend to cause diffraction which will soften the image. They also tend to distort objects in the corners or around the edges of the frame more as well as giving rise to move colour fringing. If you look back to the snow scene with the mountain, I only used an aperture of f/11.0 but was able to keep the entire frame sharp. Be deliberate about tilting or not tilting the camera and lens to control converging verticals. If your image has an interesting foreground, move in close to make the most of it. Also, consider tilting the camera downwards to emphasise elements of the frame more. Get low to help you move in close. Wide Angle lenses can distort distances even making the height of your tripod appear much greater than it is. Avoid using very small apertures which could damage image quality. 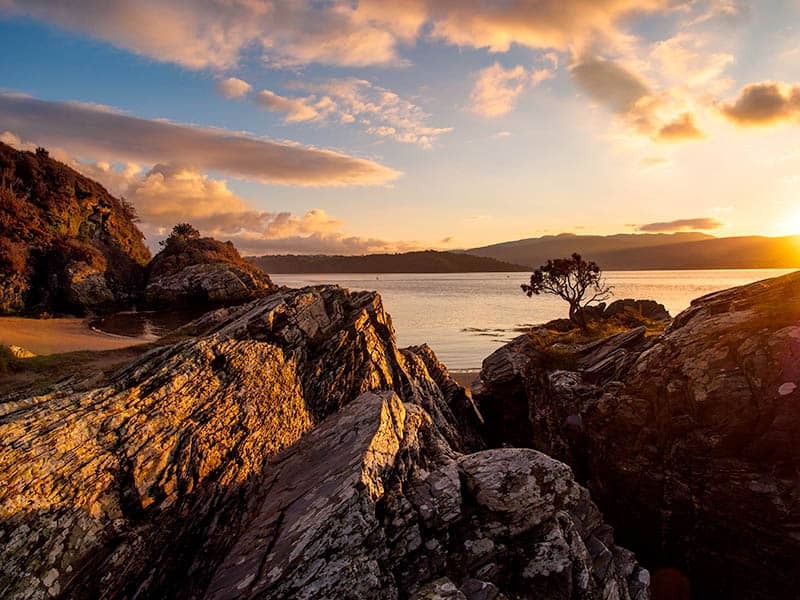 Follow these few simple steps and you will find using a wide angle lens for Landscape Photography much more rewarding. Another great way to improve your Landscape Photography results is by using filters. 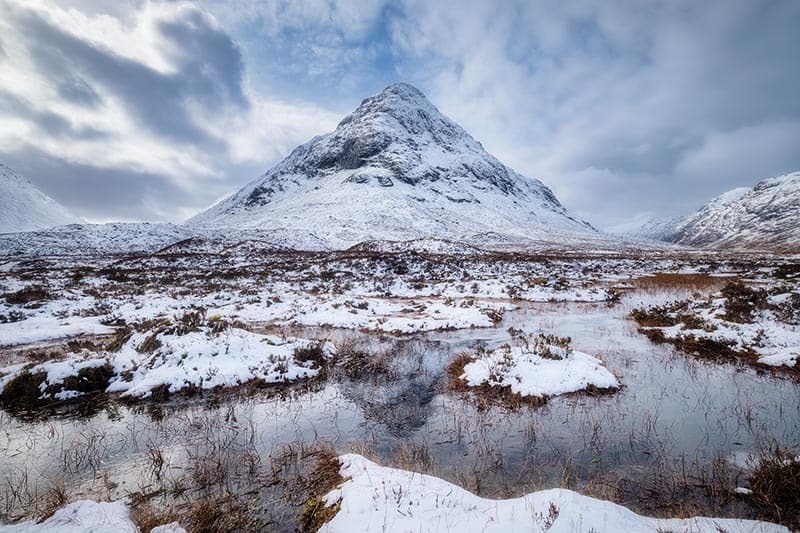 You can read about the essential landscape photography filters in this article. Thanks Martin. I’m pleased you think the advice in the article might help you. Also, don’t forget the importance of having the right light. In case you didn’t see my article about this, here’s the link https://lenscraft.co.uk/landscape-photography-tutorials/landscape-photography-tips-that-work/. Good luck. Thanks for a useful and concise summary of the use of the wide angle. I own one and have learned to use it better in 5 minutes.